Lockheed Hudson VH-SMM had a unique nose glazing configuration which evolved during a survey career spanning almost twenty years. The sole survivor of the Sydney Morning Herald's newspaper delivery Hudsons, VH-SMM was converted for aerial survey work in 1955. For its newspaper delivery role, VH-SMM had a hinged metal nose cap to facilitate loading newspapers in the nose compartment. There were no windows in the nose. 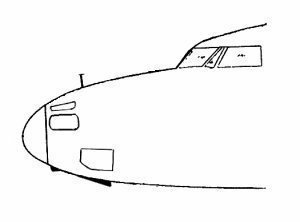 In January 1955 the Department of Civil Aviation approved the fitment of R-1830-90B engines in place of the previously installed R-1830-S1C3G. 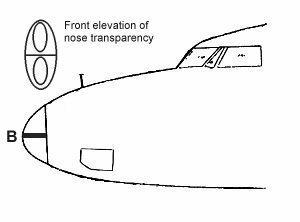 The DCA also approved the installation of two additional perspex windows (A) in the nose section. Photographs indicate that these were installed in the lower aft position on both sides of the nose. Also approved were the installation of crew oxygen and a camera hatch and camera mount near the rear door. A unique framed transparent nose cap (B) was added, probably soon after the initial survey modifications. This may have been of totally new construction or it may have been a re-working of the existing metal nose cap. The new nose cap featured two flat, framed oval windows. Apart from the framing, the balance of the nose cap was also perspex. 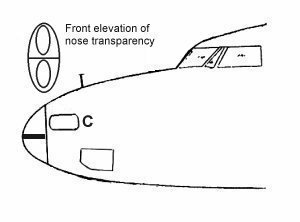 At an unknown time, an additional window (C) was added on both sides of the nose in the upper forward position. At an unknown time, a standard Hudson upper window (D) was added on top of the nose. 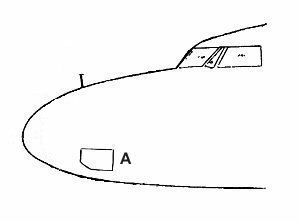 What is known about window (D) is that it was present in 1967 when the aeroplane was modified with a forward camera position but it had been skinned over by the time the aircraft was painted in the orange scheme in 1970. Also at an unknown time, another smaller window (E) also unique to VH-SMM, was installed between the standard top window and the upper forward window. The framed nose cap was retained. VH-SMM was re-registered VH-AGJ on 14th December 1966. In January 1967, the camera position was relocated from the main cabin to the nose compartment as was standard with all Adastra Hudsons except VH-SMO/AGP. 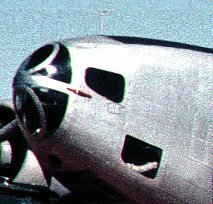 At the same time, the unique framed nose cap was replaced with a standard Hudson nose transparency (F). By the time the aeroplane was painted in the orange colour scheme in mid 1970, the upper nose window had been skinned over. At the time of writing (June 2002) the aircraft retains this configuration at the RAF Museum in Hendon, UK.